This entry was posted in aerial recession in landscape paintings, atmosphere, David Bellamy, leaving out detail, painting boats and mud and tagged painting boats, Simplification, watercolour by David Bellamy. Bookmark the permalink. Many congratulations to you and your family. I know the joy that grandchildren bring. You have joined a very special club! I love that painting. Such an exciting time for all of you congratulations to all concerned especially mum who did all the work. Will there be a DVD as well as the book? Next month of July I will be grandfather for the first time. My daughter Maria will have two twin children and my wife and I are very happy. Despite all continued to use watercolor. Please excuse my poor English. Congratulations, thank you and a greeting. Many congratulations David and Catherine! ! Hope Catherine (and you) are doing well? Sadly I hear that we are expecting our first Great Grandchild – so get a grip!! Hope you and Jenny are keeping well? Vivien and I are taking our first Art Group to Valencia next month – fingers crossed! I hear that Classic FM are taking a group to Peru, very jealous Great memories! Enjoy Spain, Barry – I hope all goes well for you. Looks as though you and Vivien are in for a lot of fun with a great grandchild and send all my best wishes. Congratulations! She is absolutely gorgeous and yes I bet you can’t wait to paint her! 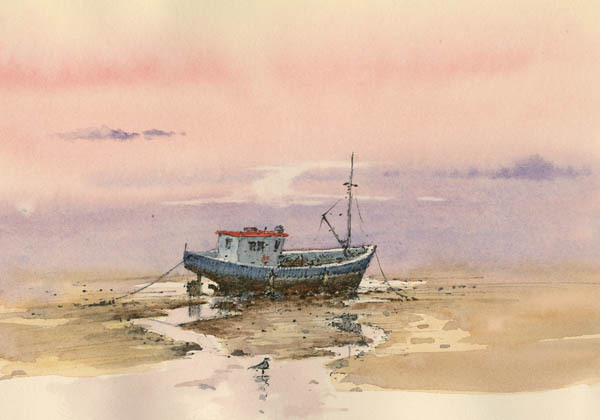 I love painting boats too and will look forward to your coastal book! Congratulations, Grampa! My daughter Cerys was born on Feb 22 – 46 years ago, and we gave her a Welsh name in honour of my Welsh background – my connection is to the Inn, We Three Loggerheads in Llanferes and the Parry family. Many congratulations to you on becoming a Grandad for the first time, there is no greater feeling than this in my experience. Every good wishes to the families and God bless you all. Still enjoying Jenny’s pastel “On the road to Hambledon” I purchased in the long ago Petersfield Gallery days. Congratulations to you and your family! She is precious and what a lovely name she has. The boat painting is beautiful and I am looking forward to a book about coastal scenery. Congratulations to you and your family! 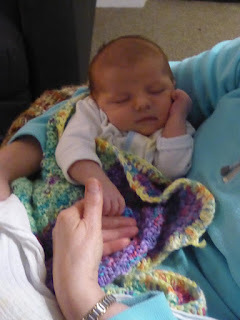 What fun it is to have a new little one in the family. Thanks for the reminder that one doesn’t have to include every little thing that one sees in the viewfinder. Painting is not bean counting! Great news ! She,s a bonny wee lass D, Errrrr Grandad Best Wishes Graham. Congratulations! You are officially a Grandad! Congratulations from australia. What a lovely name. Congratulations David. I’ve just been told that I may soon be a great granddad. Now that I find very frightening. There is an implication there that I might be getting old!!!!!! I look forward to the new books. Very best wishes to you and Jenny, Catherine and Guinevere. Thank you, Nigel. I’m sure you will have a lot of fun with your great grandchild – it’s such a marvellous excuse for having yet another childhood. Congratulations, there’s nothing like it! It’s even more fun than having your own – you’ll never stop laughing. PS Looking forward to the coastal book. Warmest congratulations on your new granddaughter, impressive that she’s an intrepid traveller already. I’m also another one looking forward to adding more books to my library. Still miss Caer Beris and those outdoor sessions. I’m delighted that you have a little granddaughter! Many congratulations! Both my grand daughters are artistic (13 and 15) and wonderful company and I’m sure you will be able to pass on some of your incredible talent and get much joy from her. I’m so looking forward to Lake Garda and seeing you and Jenny again. Congratulations, you will have many more happy hours with your granddaughter. Congratulations David, Jenny and Catherine! Hope you are saving for her first walking boots. Thank you, everyone for your kind comments, and as many of you say, it is a truly special club to become a grand-parent, and a very precious gift that has been bestowed on us. I shall, of course be doing some paintings of Guinevere when I get the opportunity.